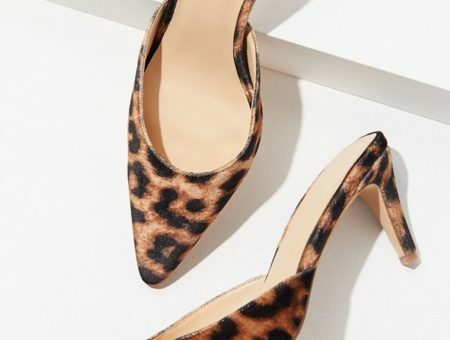 September is a major month for fashion: Fashion Weeks are happening around the globe and everyone is paying attention while shopping for their fall wardrobes. As you guys know, the reason fashion weeks are held months in advance of their prospective seasons is to give retailers time to get ready. So, even though the year doesn’t end for three months, a new wave of trends and styles is already on its way! Before we get distracted with the new fashion-forward styles coming out later this year, I thought it’d be fun to take a look back at the year’s 10 boldest trends, plus a few that are just starting to trend right now! I never jumped on this trend myself, but I really admire those of you that did! Possibly the most eclectic trend of the year, “flatforms” and creepers quickly became a street style favorite and were frequently showcased on street style sites like lookbook.nu. If the fashion calendar had a name, this would be The Year of the Skirt! 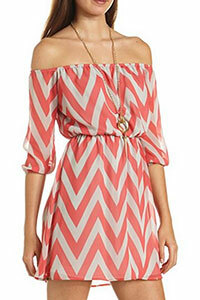 Skirt styles in 2013 were very daring and challenged traditional hem lines and skirt lengths. Various skirt trends such as asymmetric skirts, semi-sheer maxis, midi skirts, double slits, wrap skirts, and even skorts were popular throughout the year. Crop tops have been having their moment for a while, but they evolved this year as styles became more diverse. This year the crop top transitioned past basic festival or street wear, and became a more sophisticated piece suitable for dressier occasions. Some of the most notable style shifts were sleeveless crop tops, cutout crop tops,and printed crop tops with a matching skirt. Snapbacks (flat backs, baseball caps, or just a plain ‘ole hat) and beanies have been around forever but they got a glamorous makeover this year. They quickly became staple street wear pieces, and were sported by many celebrities including street style icon Cara Delevingne. Off-the-shoulder dresses and tops may have been the most popular article of clothing this year, at least, if you’re asking my Facebook feed! College girls everywhere really embraced this style, and it seemed to be a very popular choice in the Greek community for formal and social events. Sunglasses got quirky this year, and many people experimented with fun shapes like hearts and oversized cat-eyes! We loved this trend because it was easy on the wallet and offered so many styles to try. Whether you love this trend or hate this trend, nobody can deny that printed pants and leggings took the world by storm this year! This is definitely a controversial trend, but it’s not hard to see the appeal. 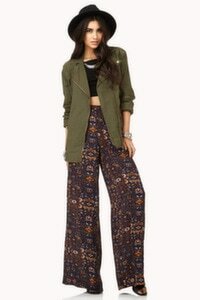 Frequently worn with combat boots and oversized tops, printed pants and leggings can easily give an outfit more personality. Also, since leggings in particular are generally on the cheap side, they allow girls to experiment with many prints without overspending. 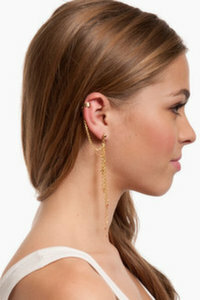 Pyramid studs, dome studs, and spikes became very popular this year as easy ways to add edge to an outfit. 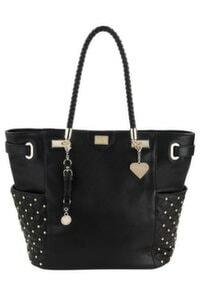 The stud trend was most notably sported on leather jackets, boots, handbags, and denim. The ’90s came back in a big way this year, and nowhere was it more apparent than with this trend! High-waisted denim shorts are now staples at music festivals, on the streets of warm-weathered cities, at college parties, and at everyday places like the mall. 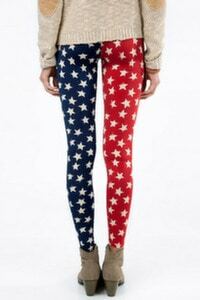 Summer 2013’s hottest styles incorporated distressing, studding, and colorful variations like American flag print. 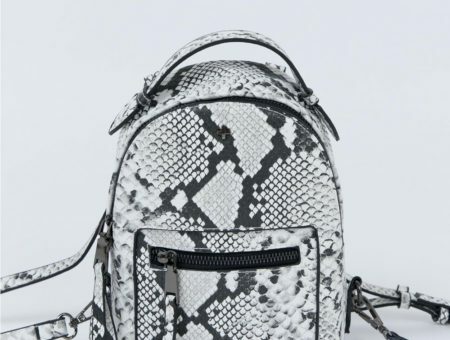 We first started seeing this trend on celebrities like Kim Kardashian who incorporated body harnesses and hair jewelry into their everyday wear. However, body jewelry is no longer a trend reserved for the famous – ear cuffs and boho headpieces are popular choices for many girls. Gauchos may be having the last laugh with the evolution of this trend! I first saw this style on Naomi in an episode of 90210, but it has only recently begun to catch on like crazy. 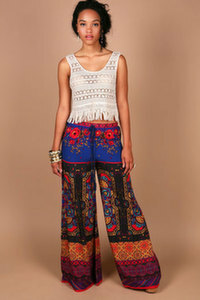 The flowy, printed, wide-leg trouser trend is gaining momentum, popping up across the blogosphere. It’s only a matter of time before it hits the streets and college campuses. Lately, it seems that clear has become the new black! I’ve seen clear hats, clear clutches, clear backpacks, and even clear socks across stores and fashion blogs! This is a very recent trend that I’ve been seeing, but I have a feeling it’s going to have its moment in the spotlight soon. 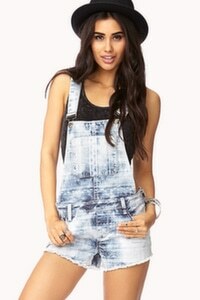 Overalls are another trend that usually divides people, but love ’em or hate ’em, they’re hotter than ever right now. During these last few weeks of warm weather, we’ve been seeing lots of “short-alls” – overalls that feature shorts instead of pants. 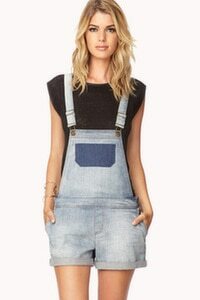 If you like this style, you could even find a pair of standard overalls at a local thrift store and cut them yourself! Do you love wearing or really dislike any of these trends? Why or why not? Which ones were your favorite? What are other bold trends from this year? Which ones do you think will last another season? Let us know in the comment section! 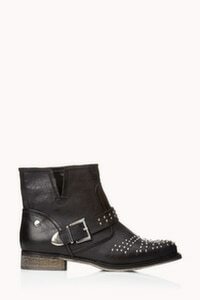 Previous Would You Wear… Cutout Boots? Next Would You Wear… Layered Hemlines?